Every season now seems like peak season for Leonard Wright, who’s constantly recruiting drivers to staff his INPAX Shipping Solutions. The relentless growth of Amazon.com Inc.’s Prime memberships has led the e-commerce giant to tap courier services like INPAX to make same-day and two-day deliveries in what’s called “the final mile” to customer homes. “In the final-mile world, there’s more work than you can handle,” said Wright, who employs 300 drivers running U.S. routes for Amazon and 200 independent contractors for non-Amazon accounts. Atlanta-based INPAX and other regional services supplement the major haulers — UPS Inc., FedEx Corp. and the U.S. Postal Service. The rush to bring everything from groceries to gourmet meals to customers’ doorsteps has sparked such a demand that job postings for delivery drivers have tripled nationwide on Indeed.com in the past three years. The dearth of truck drivers needed to carry products from city to city is well-documented, but the growth of e-commerce depends as much or more on a steady supply of qualified last-mile car and van drivers. Along with the intensifying hunt for more drivers is a growing concern about customers getting poorly served or even sick. The restaurant industry is talking with the U.S. Food and Drug Administration about ways to prevent food-borne illnesses or other problems arising from third-party delivery. Despite concerns, the forces propelling the demand for more delivery drivers show no sign of slowing. Amazon said in April that its Prime memberships had topped 100 million. Grubhub, meanwhile, works with more than 80,000 restaurants in 110 U.S. markets, up 38% in the first quarter of this year from the end of 2017, company filings show. The lack of truck drivers already is crimping corporate profits. Since people are more likely to want gig-style work on weekends, Amazon could have trouble finding enough drivers to make weekday deliveries for its on-demand Flex delivery service, which uses “crowdsourced” independent operators, said David Vernon, an analyst with Bernstein Research. 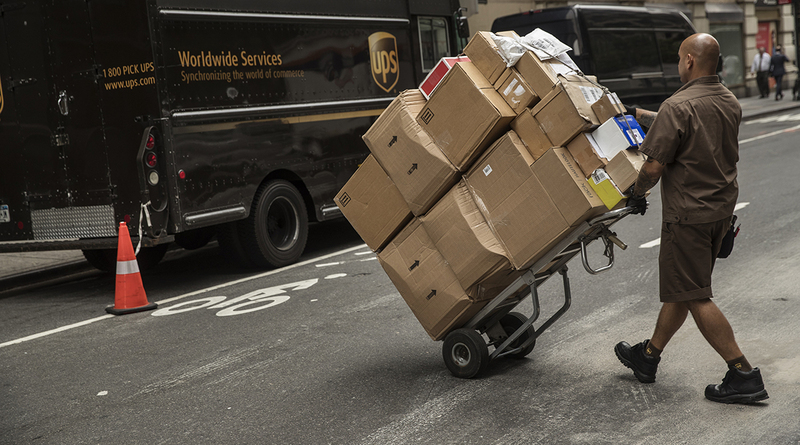 That’s among the challenges that could keep Amazon’s Flex unit from threatening the business models of UPS and FedEx, Vernon wrote in a May 24 research note. With supermarkets set to move more heavily into food delivery, competition for drivers will ramp up further, said Antony Karabus of HRC Retail Advisory. Keeping raw chicken and milk from spoiling means they’ll need more training than most delivery people. Too many food delivery companies are chasing too little business, and several will be forced to consolidate to survive, Karabus said. In the package business, venture-capital backed shipping company Shyp shut down in March after realizing too late that it needed to focus on business shipments rather than consumer ones. Uneven driver quality is already bedeviling some businesses. Cielo Blue, a Mexican grill in suburban Atlanta, dropped Grubhub a few weeks ago after fielding too many customer complaints. “They’d call us and say the food is cold,” manager Wilson Vera said. Vera is seeing better results with Uber Eats, which he attributes to Uber’s bevy of ride-share drivers circling the area at all times who can quickly switch from passenger to food delivery. A Grubhub spokeswoman said the company’s drivers are required to use hot or cold delivery bags, and that the company strives to make things right with the customer when there’s a problem with the food. In addition to restaurant complaints, consumers are venting about woeful package delivery on Twitter, YouTube and occasionally the local news. A February segment on San Francisco’s CBS affiliate showed a driver for Amazon chucking a package out the passenger window of his compact car onto a woman’s driveway. A New York man’s Change.org petition seeks to have Virginia-based LaserShip Inc. removed as one of Amazon’s delivery partners due to service problems. It had 70 signatures through June 12. A LaserShip spokeswoman referred questions to a company executive, who was unavailable for comment. A coalition of state restaurant associations has gathered to discuss potential regulation or legislation concerning the rise of third-party delivery companies. The restaurant industry hopes to get buy-in from delivery companies before going to legislators, said Anna Tauzin, vice president of marketing and innovation for the Texas Restaurant Association. “If there is an incident out there, who’s liable?” said the National Restaurant Association’s Weichelt. Mike Dickey, a 30-year veteran of the restaurant business, paused to collect his thoughts when asked about the growth of Grubhub Inc., DoorDash, Uber Eats and other third-party delivery companies. He’s conflicted about the tech companies that now deliver 20 meals a day for his Uncle Maddio’s Pizza franchise in suburban Atlanta and also take a 30% slice of every sale. Those fees hurt in a low-margin business, said Dickey, who has also fielded customer complaints when pizza arrives late or cold. But with food couriers so pervasive that many restaurants have four or five stickers on their doors advertising different delivery services, Dickey risks losing sales to competitors if he doesn’t offer the same convenience. With assistance from Spencer Soper and Margaret Newkirk.